After yo-yo dieting for some years and trying to get my weight back on track after having some health issues, I realized nothing I tried was working. I tried weight watchers, tracking my food, exercise, low carb, etc. When another doctor recommended Dr. Chhabra to me, at first I was hesitant – I didn’t make the initial appointment for nearly 2 years! Finally I realized that I needed a “reset button” – something I haven’t tried before. I had never heard about medical weight loss diets before, and I was hesitant – I thought I would be hungry all the time and wouldn’t be able to stay on the program. I don’t know what took me so long – every step in this that led to the problems with my weight in the first place. Optifast has also made a difference in what food I choose to eat when I do eat, and has made a big difference in my overall health. 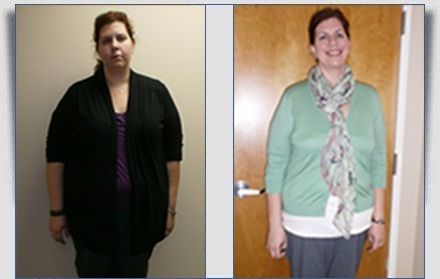 The program is very easy to follow – I really haven’t been hungry at any point during this process. I am not only much thinner now, but wiser to my eating habits and happier overall. I went from a (snug) size 24/26 to a size 16 in 10 months – I am amazed! I now also exercise 6 days a week, including spinning, which I never thought I could do before. My fitness level has also increased tremendously not only because of the weight loss, but the support and encouragement I’ve received from Dr. Chhabra. I can’t thank Dr. Chhabra and the staff at the Institute for Weight Management enough for the program and providing me with the tools and support for my weight loss journey – although I’m not quite at my goal yet, I’m excited to keep going with my new lifestyle! *The success stories depicted in this section are representative of these individuals only. Individual results may vary.